We list here all the foods we currently offer on our regular menus. Each dish shows possible allergens, plus additional information which may be useful, re. religious doctrine, diet, lifestyle choice, etc. We have also added allium information. Where cheese is mentioned, unless otherwise stated, if rennet is used, it is animal-based. In brackets we show modifications which can be made to dishes if requested. We also show where a possible allergen is present but only in small quantity. Ask us for specific information about any dish. Gluten-free dishes. There is now a separate menu showing all our regular GF dishes, and dishes modified to be GF (modified dishes are not actually shown here). Please ask for this menu. LIkewise, we have a vegetarian/vegan menu too. Ask for this menu. Note, whilst we strive to strictly follow allergen guidelines, there are often small practical problems. For example, our deep-fat fryers are used for items containing some gluten, and there may be ‘cross-over’ between these and dishes we state as gluten-free like chips, be it minimal. If you have serious issues with specific allergens, then please discuss it with us, preferably in advance. Happy to help as much as we can. If you would like more information at the hotel, please ask your server. They may not have the exact answer but can ask someone who will. Or you can contact us using the form at the bottom of this page. All our menus can be found as PDFs at angelabergavenny.com/dining. Below is our Angel menu offered in the restaurant, lunch and dinner: £32.00 for three courses (lunch and dinner). For other dishes click a link above. Contains egg – part cooked, milk – cream, fish, allium (onion family). Gluten-free, non-meat. Contains gluten – wheat flour, milk – cheese, garlic. Vegetarian. Contains pork – cured, allium (onion family). Minor amount of celery. Gluten-free. Contains fish, allium (onion family). Minor amount of celery. Gluten-free, non-meat. Contains beef. Minor amount of celery, onion. Contains gluten – wheat flour, egg yolk – cooked, milk – cream. Vegetarian. Contains gluten – wheat flour, egg yolk – cooked, milk – cream, alcohol – cooked, residual, no sulphur dioxide. Vegetarian. Contains gluten, egg – cooked, milk – cream, hazelnuts. Vegetarian. 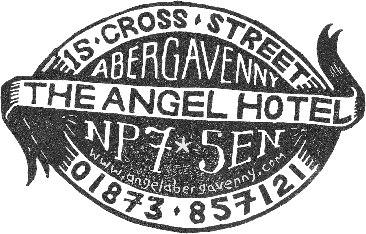 The Angel Hotel, 15 Cross Street, Abergavenny, Monmouthshire, Wales NP7 5EN UK. This information is provided to fulfil our responsibilities under the 2014 ‘EU Regulation 1169/2011’ which came into force 13 December 2014. © Copyright 2019 Angel Hotel, Abergavenny and Croque-Web Design.